Edward VI (October 12, 1537 – July 6, 1553) became King of England and Ireland on January 28, 1547, at just ten years of age. Edward, the son of Henry VIII and Jane Seymour, was the third monarch of the Tudor dynasty and England's first ruler who was Protestant at the time of his ascension to the throne. Edward's entire rule was mediated through a council of regency, as he never reached majority. The council was first led by his uncle, Edward Seymour, 1st Duke of Somerset (1547-1549), and then by John Dudley, 1st Duke of Northumberland. Although Henry VIII had broken the link between the English church and Rome, it was during Edward's reign that a form of Protestantism (which came to be known as Anglicanism) became truly established. Thomas Cranmer, the Archbishop of Canterbury, implemented the Book of Common Prayer during Edward’s reign, a major step in establishing an identity for the Church of England. Edward's reign was marked by increasingly harsh Protestant reforms, the loss of control of Scotland, and an economic downturn. A period of social unrest begun earlier intensified during Edward's rule, and conflicts with the French increased. The young king's advisors persuaded him to attempt to exclude his two half sisters, the devout Catholic Mary and moderate Protestant Elizabeth, from the line of succession to the throne in order to put the Lady Jane Grey—the solidly Protestant daughter-in-law of the chief regent—next in line to succeed the king. Following Edward's death at age 15, a disputed succession reopened the religious conflicts. Lady Jane was queen for only nine days—during that time reigning in name only—before she was replaced by Mary. Queen Mary then sought to undo many of Edward's Protestant reforms. So eloquent and popular, however, were the new English-language services of the Book of Common Prayer that it was destined to become a classic and much cherished part of English religious life. Although his reign was short, Edward's genuine interest in religion and in reformed theology is believed to have influenced the content both of the Book of Common Prayer and of the 42 Articles of Religion (1553) (later revised as the 39 Articles), as well as the general move away from what were considered Catholic practices in worship, such as the use of lights, incense and holy water. With Edward's support, Cranmer laid the foundations of the Church of England, including its characteristic inclusivity, which many people consider to be the English reformation's most important contribution. Without Edward's support, these foundations would not have been laid, since under Edward's successor, Mary, Catholicism was re-instated and Cranmer was executed. Edward was born at Hampton Court Palace in the London Borough of Richmond upon Thames. He was the son of King Henry VIII by his wife, Jane Seymour, who died twelve days afterwards from puerperal fever. It is sometimes asserted that Jane sacrificed her life by the performance of a Caesarean section, but such assertions are without basis. Edward automatically became Duke of Cornwall upon his birth; a few days later he was created Prince of Wales. His initial care until the age of six was left to his nurse, Mother Jack, and various servants but his stepmother Queen Catherine Parr later took over that function. Henry VIII was extremely pleased by the birth of a male heir. He had left his two previous wives, Catherine of Aragon (mother of Mary) and Anne Boleyn (mother of Elizabeth), because of their failure to produce male heirs. Both marriages were annulled, Anne Boleyn was executed, and Mary and Elizabeth were deemed illegitimate. Despite their illegitimacy, however, they were reinserted into the line of succession after Edward VI in 1544. Edward at the age of six. Up until recently, it has been widely accepted that Edward VI was an extremely sickly child. Theories have speculated that he suffered from congenital syphilis or from tuberculosis. His first illness, experienced at the age of four, was a "quartan fever" which lasted for months. 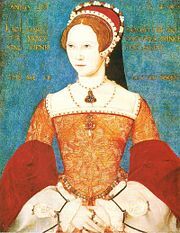 His supposed frailty may have led Henry VIII to quickly seek to remarry; the king's last three marriages (Anne of Cleves, Katherine Howard, and Catherine Parr), however, did not produce any children. Edward's own journals mention no illness at all apart from a bout of measles in 1552, and the pulmonary tuberculosis that killed him. The policies of the Duke of Northumberland also indicate that he was making a foundation on which Edward was expected to build when he reached his majority, rather than expecting Edward to die young. Edward's supposed physical difficulties did not impede his education; on the contrary, the young prince was a very bright child, already able to read and speak Greek and Latin at the age of seven. His principal tutors were Bishop Richard Cox, Sir John Cheke and Jean Belmain. These were able teachers and great minds at the time and imparted in Edward his knowledge of the Classics, seemingly based on the course of instruction described by Desiderius Erasmus and Juan Luis Vives (1492-1560). Importantly, Henry VIII chose his tutors because they were humanists and moderate Protestants . His education was colored by the Reformation that had swept through the Netherlands and Germany, a conscious plan of his father's. He later learned to speak French and Greek, and, by the age of 13, he was translating books into the latter language. He was quite fond of his stepmother Catherine Parr, who oversaw his education, and wrote three letters to her, one each in French, English and Latin. The rest of the letters he wrote were in Latin to his sisters. Edward also had strong feelings for his sister Mary. His love of learning and writing led him to found many grammar schools that were named after him. Edward VI's uncle, Edward Seymour, 1st Duke of Somerset, ruled England in the name of his nephew as Lord Protector from 1547 to 1549. 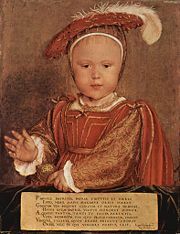 Henry VIII died on January 28, 1547, when Edward was only 9. His will named sixteen executors, who were to act as Council of Regents until Edward VI achieved majority at the age of 18 (although it was agreed by the council in 1552 that Edward would reach his majority at 16). These executors were to be supplemented by 12 assistants, who would only participate when the others deemed it fit. The executors were all inclined towards religious reformation, whose most prominent opponents, Thomas Howard, 3rd Duke of Norfolk, Stephen Gardiner (the Bishop of Winchester) and Thomas Thirlby (the Bishop of Westminster), were excluded because of Catholic sympathies. The council immediately appointed the boy king's maternal uncle, Edward Seymour, then Earl of Hertford, to serve as Lord Protector of the Realm and Governor of the King's Person during Edward VI's minority. A few days after Henry VIII's death, Lord Hertford was created Duke of Somerset and appointed to the influential positions of Lord High Treasurer and Earl Marshal. Prince Edward was crowned as king at Westminster Abbey on February 20, 1547. To allay all doubts regarding the validity of Henry VIII's will, all the executors sought reappointment from Edward. On March 13, 1547, Edward VI created a new council of 26 members. The council consisted of all the executors and assistants, except for Thomas Wriothesley, 1st Earl of Southampton (who, whilst serving as Lord Chancellor, had illegally delegated some of his powers to other officials) and Edward Seymour, 1st Duke of Somerset. Somerset, as Lord Protector, was only supposed to act on the advice of the other executors but was able to gain near complete control of government after obtaining the power to change the composition of the council at his whim. The Lord Protector, then, became the real ruler of England with Edward VI acting in a largely ceremonial role. Somerset's administration of the country would prove to be more merciful than tactical and more idealistic than practical; Henry VIII's treason and heresy acts were repealed or changed, resulting in social and political unrest. One of the Duke of Somerset's primary aims was to achieve a union between England and Scotland. In late 1547 an English army marched into Scotland and took control of the Lowlands in the Battle of Pinkie Cleugh. This action was the closing chapter in the War of the Rough Wooing and in the Anglo-Scottish Wars that had been simmering throughout the sixteenth century. In 1548, however, Mary, the young Scottish queen, was betrothed to the Dauphin Francis II of France, the heir-apparent to the French Throne, thereby strengthening the alliance between France and Scotland. The Duke of Somerset was hardly in a position to oppose both France and Scotland, as his own position was insecure. His brother and the widower of Catherine Parr, Thomas Seymour, 1st Baron Seymour of Sudeley, the Lord High Admiral, took advantage of this weakness by hatching a plot to depose Somerset. Lord Seymour's conspiracy, however, was exposed in 1549. A bill of attainder was introduced and passed almost unanimously by Parliament. Somerset was hesitant to sign his brother's death warrant, so Edward very reluctantly gave his consent to the council; Lord Seymour was executed by beheading on March 20. Thomas Seymour was Edward's favorite uncle and his death would embitter the young king toward Protector Somerset. Another powerful influence on Edward VI was Thomas Cranmer, the Archbishop of Canterbury. Both Cranmer and the Duke of Somerset were committed to creating a Protestant England. Various Catholic rites were replaced with Protestant ones. One of the most notable was Cranmer's Book of Common Prayer, which was published solely in English in 1549 to replace the four old liturgical books in Latin. The political aim of the work was to unite moderate religious factions into a single Protestant fold by obscuring the role of Mass and downplaying the status of saints. Its use was enforced by an the Act of Uniformity (1549) but it only served to antagonize both Protestants and Catholics alike. Zealous reformers such as John Knox were appointed as court chaplains. The Duke of Somerset, however, did not encourage persecution; rather, he refrained from it, as he feared the wrath of Europe's powerful Catholic monarchs, especially the Holy Roman Emperor Charles V.
Inflation and the cost of war combined to double prices from 1547 to 1549. The wool industry, however, boomed during this time, through the ongoing fencing in or “enclosure” of the landscape to raise sheep for individual proprietors. This often displaced common land (land that the public could use) and therefore caused great social unrest known as the enclosure riots. So, the enforced introduction of the Book of Common Prayer on Whit Sunday in 1549 sparked an uprising known as the Prayer Book Rebellion or Western Rebellion. Introduction of the new prayer book was widely unpopular, but nowhere more so than among the people of Devon and Cornwall in the southwest of England, most of whom did not speak English at this time. In London, Edward and his Privy Council became alarmed by this news from the southwest. One of the Privy Councilors, Sir Gawain Carew, was ordered to pacify the rebels. At the same time John Russell, 1st Earl of Bedford was ordered to take an army, composed mainly of German and Italian mercenaries, and impose a military solution. The uprising was quickly suppressed at Crediton, Sampford Courtenay and Fenny Bridges in Devon, before the mercenary forces moved into Cornwall. In total four thousand rebels lost their lives in the action and all further proposals to translate the Book of Common Prayer into Cornish were suppressed. On August 8, taking advantage of internal strife, the French, under Henry II, formally declared war on England. The Duke of Somerset became extremely unpopular, even among his own council. In October 1549, he was deposed and sent under arrest to the Tower of London by John Dudley. 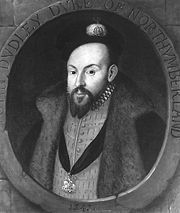 Somerset was deposed, but John Dudley, 1st Duke of Northumberland and Earl of Warwick did not make himself Lord Protector, and even encouraged Edward VI into declaring his majority as soon as he was sixteen. In 1550, Lord Northumberland conciliated the peasant rebels and made peace with France, giving up all of England's possessions in Scotland and Boulogne without compensation. Unlike Somerset, Warwick was a man of action who was full of ambition to officially install and enforce an inflexible form of Protestantism and enrich himself with land and power. The rise of the John Dudley was accompanied by the fall of Catholicism in England. Use of the Book of Common Prayer in all church services was more strictly enforced and all official editions of the Bible were accompanied by anti-Catholic annotations. Catholic symbols in churches were desecrated by mobs and the Ordinal of 1550 replaced the divine ordination of priests with a government-run appointment system. Religious dissenters, moreover, were often persecuted and burnt at the stake. In 1550 and 1551, the most powerful Roman Catholic Bishops, Edmund Bonner (the Bishop of London), Stephen Gardiner (the Bishop of Winchester) and Nicholas Heath (the Bishop of Worcester) included, were deposed; and their places taken by Protestant reformers such as Nicholas Ridley. The council under Warwick also systematically confiscated church territories and Warwick himself had the ambition to be the largest landowner in England. Meanwhile, the Duke of Somerset, who agreed to submit to Lord Warwick, was released from prison and readmitted to the Privy Council. Within a few months, he found himself powerful enough to demand the release of other political and religious prisoners. He opposed the council's attempt to curtail the religious liberty of Edward's sister, Mary. The Duke of Somerset's opposition to the more radical form of religious Reformation irked Lord Warwick. Dudley attempted to increase his own prestige; on his advice, Edward created him Duke of Northumberland and bestowed honors on his numerous supporters. The Duke of Northumberland began a campaign to discredit the Duke of Somerset. The people of London were informed that the Duke of Somerset would destroy their city; Edward was told that the Duke would depose and imprison him and seize his crown. It was also suggested that the Duke of Somerset had plotted to murder the Duke of Northumberland. In December of 1551, the Duke of Somerset was tried for treason on the grounds that he had attempted to imprison a member of the King's Council. The treason charge, however, could not be proven; instead, Somerset was found guilty of participating in unlawful assemblies, but was still sentenced to death. The Duke of Somerset was subsequently executed in January 1552. On the day after the Duke of Somerset's execution, a new session of Parliament began. It passed the Act of Uniformity (1552), under which a second Book of Common Prayer was required for church services. Unauthorized worship was punishable by up to life imprisonment. During his father's reign, Edward had effectively been mollycoddled and kept in seclusion. Edward desperately wanted his own freedom, and indulged in the early years of his reign with other children of his age. He became extremely fond of sports such as tennis. 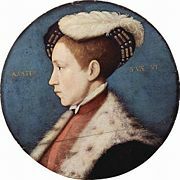 During the winter of 1552–1553, Edward VI, strained by physical activities in the bitter weather, contracted a cold. Doctors tried to help by administering various medicines, but their efforts were in vain, leaving Edward in perpetual agony. The first symptoms of tuberculosis were manifest in January 1553 and by May it was obvious that his condition was fatal. Edward was enough the master of his own destiny to have concerns about the succession addressed. Having been brought up a Protestant, he had no desire to be succeeded by his older half-sister and devote Catholic, Mary. At the same time, the Duke of Northumberland was eager to retain his own power. He did not find the next two individuals in the line of succession, Mary and Elizabeth, conducive to his aims. The third individual in the line of succession under Henry VIII's will was Lady Frances Brandon (the daughter of Henry's younger sister Mary Tudor, queen consort of France by Charles Brandon, 1st Duke of Suffolk); she, too, was not to Northumberland's liking. Northumberland feared that the Frances' husband, Henry Grey, 1st Duke of Suffolk, would claim the crown as his own. 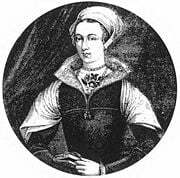 The Duke of Northumberland then foolishly attempted to rule through the Duchess of Suffolk's daughter, the Lady Jane Grey. Jane was married off to the Duke of Northumberland's younger son, Guilford Dudley. On June 11, 1553, Northumberland commanded senior judges to draw up a draft will for Edward. The plan was illegal for many reasons; firstly, a minor did not have the authority to make a will. Furthermore, Edward's will had not been authorized by any Act of Parliament, whilst Henry's will (which Northumberland sought to abrogate), had been specifically authorized by an Act passed in 1544. The judges at first resisted giving in to the Duke of Northumberland's demands, as it was treason to attempt to vary the laws of succession established in 1544. Edward, however, ensured their co-operation by promising a pardon under the Great Seal of the Realm. The first draft of the will excluded Mary, Elizabeth, the Duchess of Suffolk and the Lady Jane from the line of succession on the theory that no woman could rule England. The crown was to be left to the Lady Jane's heirs-male. This plan, however, was not to Northumberland's liking (probably because Lady Jane had no male heirs at this time, having only been married a month or so before); the draft was changed to leave the crown to Jane and her heirs-male. Mary and Elizabeth were excluded because they were officially illegitimate; the Duchess of Suffolk agreed to renounce her own claims. As Edward VI lay dying, the Duke of Northumberland (according to legend) symbolically stole the crown from him and gave it to his daughter-in-law, the Lady Jane. Edward VI died at Greenwich Palace on July 9, 1553, either of tuberculosis, arsenic poisoning, or syphilis. He was buried in Henry VII Lady Chapel at Westminster Abbey by Thomas Cranmer with Protestant rites on August 9, while Mary had Mass said for his soul in the Tower. Edward VI's death was kept secret for a couple of days so that preparations could be made for Jane's accession. High civic authorities privately swore their allegiance to the new queen regnant, who was not publicly proclaimed until July 10. But the people were much more supportive of the rightful heir under the Act of Succession, Mary. On July 19, Mary rode triumphantly into London, and Jane was forced to give up the crown. Jane's proclamation was revoked as an act done under coercion; her succession was deemed unlawful. Thus, Edward VI's de jure successor was Mary I (1553–58), but his de facto successor was Jane. The Duke of Northumberland was executed, but the Lady Jane and her father were originally spared. In 1554, when Mary faced Wyatt's Rebellion, the Duke of Suffolk once again attempted to put his daughter on the throne. For this crime, Jane, her husband, and the Duke of Suffolk were executed. After Edward VI's death, rumors of his survival persisted. To take advantage of the people's delusions, several impostors were put forward as rightful kings. These impersonations continued throughout Mary I's reign, and even far into Elizabeth I's reign (1558–1603). Mistaken identities also feature in the author Mark Twain's novel, The Prince and the Pauper, in which the young Edward VI and a pauper boy of identical appearance accidentally replace each other. 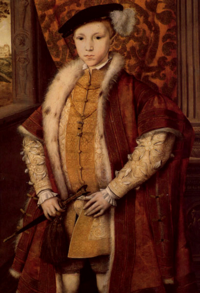 Like his father, Edward VI was referred to with the styles "Majesty," "Highness," and "Grace." His official style was of the same form as his father: "Edward the Sixth, by the Grace of God, King of England, France and Ireland, Fidei defensor (Defender of the Faith) and of the Church of England and also of Ireland in Earth Supreme Head." Edward VI's arms were the same as those used by his predecessors since Henry IV of England: Quarterly, Azure three fleurs-de-lys Or (for France) and Gules three lions passant guardant in pale Or (for England). ↑ 1.0 1.1 1.2 Williamson, 66. ↑ Columbia Encyclopedia (2005), "Edward VI"
↑ 8.0 8.1 8.2 8.3 8.4 Encyclopaedia Britannica (2005), "United Kingdom: Edward VI (1547-53)"
↑ Encyclopaedia Britannica (2005), "Edward VI"
"Edward VI (1547-1553 C.E. )," Britannia.com. Accessed May 28, 2006. "King Edward VI," Royalty.nu, The Royal Tudor Dynasty. Accessed May 28, 2006. "Edward VI," Encyclopædia Britannica (1911) 11th ed. London: Cambridge University Press. "Edward VI," Encyclopædia Britannica (2005). "Edward VI," Columbia Encyclopedia (2005). All links retrieved September 21, 2017. Illustrated history of Edward VI. History of "Edward VI of England"
This page was last modified on 21 September 2017, at 15:46.